The Anya and Andrew Shiva Gallery is located on the north west corner of 59th street and Eleventh Avenue, at 860 Eleventh Avenue New York, NY 10019. Centrally located in Manhattan’s chic, mid-town neighborhood near Lincoln Center and the Broadway theater district it has access to ample transportation options. The main entrance can be accessed on Eleventh Avenue. Take #1, A, B, C, or D to 59th Street & Columbus Circle, walk west to 59th Street between 10th and 11th Avenues. Take N, R, Q to 57th Street & 7th Avenue, walk west to 59th Street between 10th and 11th Avenues. Take the M57 or M31 to 10th Avenue and 57th Street and walk two blocks north to 59th Street. Turn left and walk half a block west to the main entrance. 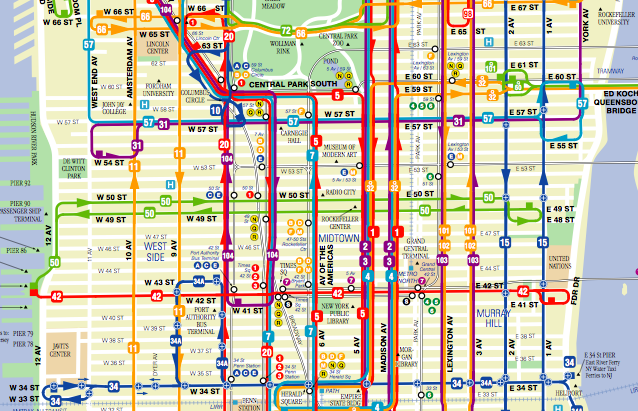 For a complete Manhattan bus map, click here.